This Xbox press conference from Gamescom is pretty low-key, focusing more on intimate reveals rather than a big presentation like we saw at the Electronic Entertainment Expo. Nevertheless, we’re seeing some interesting reveals from the event – including a trio of titles that were really popular back on the Xbox 360. Microsoft confirmed during its press conference today that it will bring a trio of Kinect-powered games to the Xbox One, powered with 4K support and HDR. The games are Disneyland Adventures, Rush: A Disney/Pixar Adventure and Zoo Tycoon. While the games don’t have release dates, they’re expected to arrive sometime early next year. The games don’t have Kinect in the title, you may notice. Well, if you want to play them with your Xbox One Kinect, you sure can, as the games will support it. However, all three titles will have controller support for the first time, so you can play that way if you prefer. Microsoft didn’t break down how the controls would work with these games, but we’ll likely get more details in the months ahead. Disneyland Adventures will allow players to virtually visit the theme park and complete different objectives, while running into a few familiar characters. There are a number of missions to complete, and being able to play with typical controls should make the game a lot easier for some players. 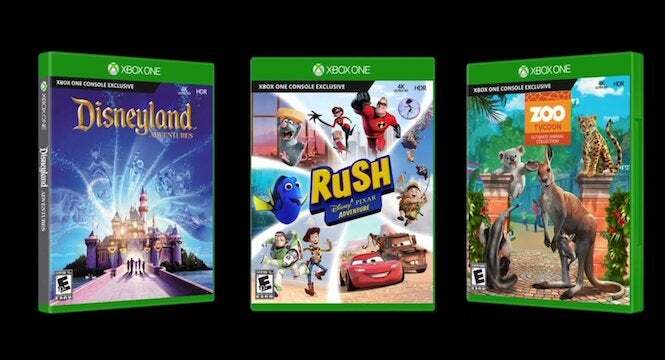 Rush will include a number of scenarios from popular Disney/Pixar films, including Finding Nemo, Toy Story, Cars, The Incredible, Ratatouille, and Up, and more could possibly be introduced in the final game. Again, you’ll be able to use regular controls here. Finally, Zoo Tycoon will see a re-release with support for controller play, and enables you to interact with many animals while partaking in a special safari. Again, the games don’t have a release date, but we’re expecting to see them over the next few months. The real question is whether we’ll see other Kinect-powered games make their way to the Xbox One with controller support. How well would something like Kinect Sports work with it? Guess we’ll find out as Microsoft eventually announces more games.